Press In the News | Edie, The Salsa FREAK!! 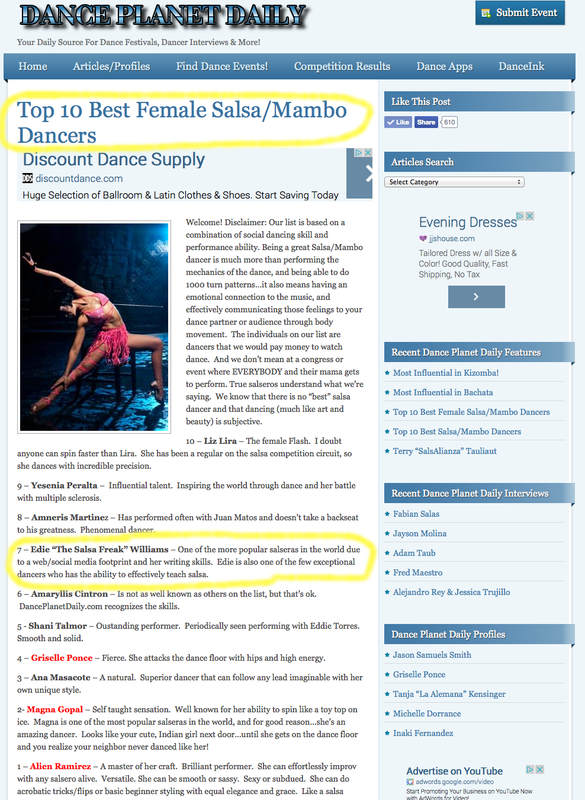 … voted in TOP TEN Salsa / Mambo dancers in the WORLD!! ance, like martial arts, is for many a lifelong journey. That’s the parallel professional dance instructor Edie Williams drew last year when she named her new dance instruction method Black Belt Salsa. It’s full-contact dancing, to be sure, but there’s nothing combative about it. Here in Durango, Williams’ “Grasshopper” is Erin White Sinberg, Sinberg has been a Salsa aficionado for years, and was one of Williams first students last year. Think of it as a victimless pyramid scheme: you teach two friends, and they teach two friends. “The idea is you learn not only how to dance but how to teach people how to dance,” Sinberg said. Only the most accomplished students can become instructors. Students of Black Belt Salsa, like those in many martial arts disciplines, can measure their progress through belts. Newbies first earn a white belt before continuing on for orange, yellow, camo, green, purple and blue. From there, brown, red and black belts are reserved for instructors of varying accomplishment. In just more than a year, Black Belt Salsa schools have sprung up in 11 states and 12 foreign countries. A year ago, Sinberg was a self-described “dance nerd” who was looking for a weekly Salsa fix. While Moe’s holds a weekly Salsa night every Thursday, she said as a working mother the midweek party just happens too late for her. She often went to Albuquerque or Denver on weekends to find the right crowd. “That’s a long way to go to dance, and I knew there had to be people here like me,” she said. Although Sinberg attended Williams’ first hands-on instruction workshops in Colorado Springs, she has not yet earned the first black belt. Currently, she’s certified as a red/brown belt, which still allows her to have two apprentices herself – Ed Ferrigan and Louvelle Zinser – and teach a class that averages about 20 dancers each week. Sinberg’s classes meet weekly at Cocktails & Creations and beginners and intermediates are not separated during class (none has yet achieved the label of “expert”). Tonya Outlaw’s students have earned white belts in their training. But they didn’t do so by learning blocks, kicks and offensive moves associated with martial arts. Instead, they have learned basic salsa steps and turns in Black Belt Salsa, a new method of teaching salsa developed by “Edie the Salsa Freak,” a world-renowned salsa instructor based in Colorado. Students follow a curriculum for each belt level and earn belts as they master salsa techniques. Belts range from the white belt – mastering right turns, left turns, core and dips – to green belt – adding complexity and creativity to the core moves. Students can test to be an instructor after mastering the highest belt.For the past year, Outlaw and other instructors at Baile con SazÃ³n Studio on North Reilly Road have followed the program. Baile con SazÃ³n Studio began the program in February 2012 and is one of two certified Black Belt Salsa programs in the state. The other is in Charlotte. The Black Belt Salsa program helps students learn social salsa dancing with an emphasis on technique, Outlaw said. Within each color level of belt, there are degrees, or sub-steps to master before reaching the next level. The program also looks at the psychology of salsa, including the roles of men and women in the dance. For example, the instructors using an analogy of a rock and water to explain the man’s role as the lead and the woman’s role to follow. The group, which includes Willie McIntosh, once operated BailaCante. They taught weekly beginner and intermediate courses at VIA 216 Bar & Grill in Tallywood Shopping Center. Needing more room, they opened a studio on North Reilly Road. Their studio operates as a Salsa Academy. On a recent Monday, Sara Mitchell sat underneath wooden markers on the wall that indicated each students’ belt level. Willie Colon’s “Sin Poderte Hablar ” played on the stereo as she waited for the start of the class. Mitchell has risen in the ranks of belts. She is now an apprentice baby blue belt, an instructor in training. She helps with the white belts in the beginner classes. Mitchell, 26, has been taking classes since November. Jerry Pruitt, 58, likes the methodical approach of the class. Outlaw has noticed a higher retention rate of students continuing lessons since starting Black Belt Salsa. Outlaw, who started dancing in the late 1990s, is excited about the studio’s role with the Black Belt Salsa program. “I love it that we are helping it to grow and that we are growing dancers,” she said. Want to learn how to salsa? Check out these places. Baile con SazÃ³n Studio: 500 N. Reilly Road, Suite 110. The studio offers Black Belt Salsa. Classes are $8 per class for walk-ins; $30 for four weeks (two classes a week); and $50 a month for unlimited dance. Call 237-7948, go to baileconsazon.com or email info@baileconsazon.com. Roland’s Dance Studio: 310 Hope Mills Road. Call 423-2623 or go to danceatrolands.com for salsa lesson information. Fayetteville Technical Community College: Beginners Latin dance classes are Saturday from 10 a.m. to noon April 28-May 4 with another course June 1-22. Register a week before the class. Cost is $40. Call 678-8386.